What do you think of this artsy photo of my tortellini?? Pretty yummy looking. Am I right?? I woke up yesterday thinking, “Today I will make pasta.” I wanted to challenge myself and make a style of pasta I’ve never tried before. Tortellini it was. Now, I know that if I had a tortellini craving I could just shop the freezer section of my local market, but why do that when fresh pasta tastes infinitely better?? 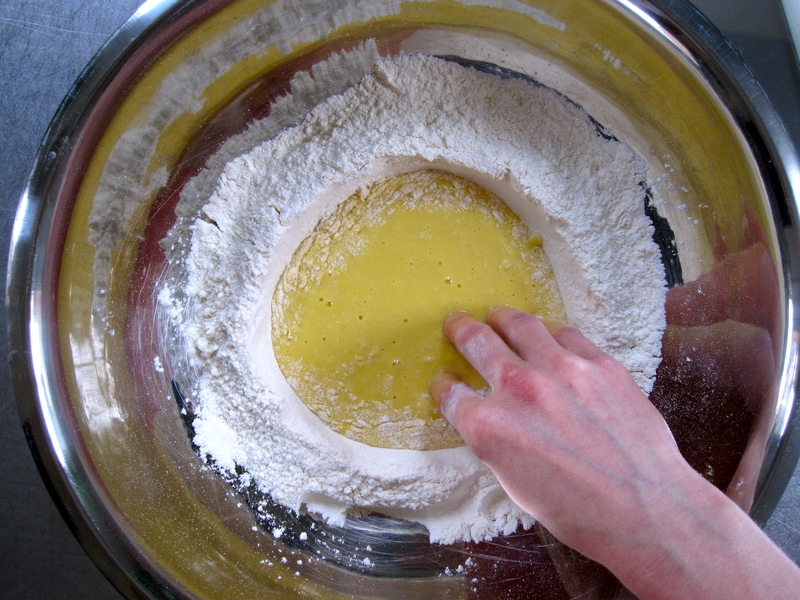 And besides, fresh pasta is so simple to make. 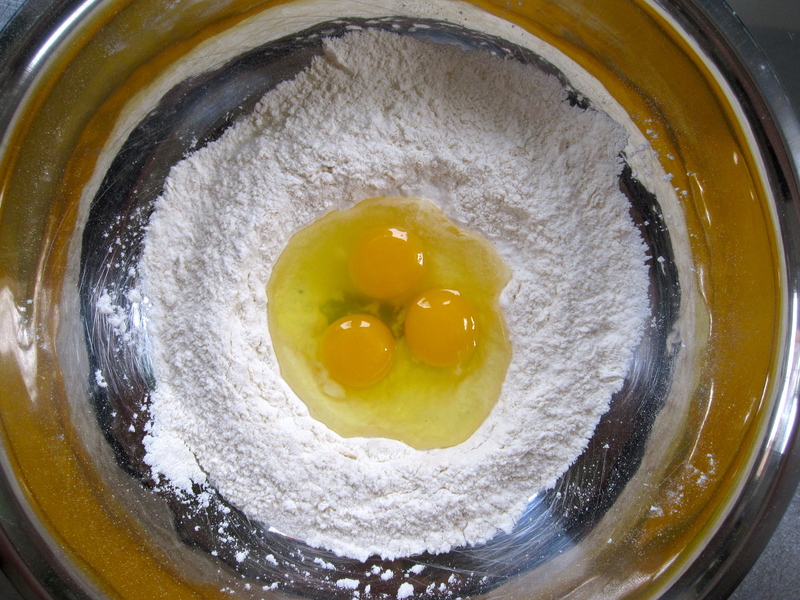 All you need is flour, eggs, salt, and a little patience and elbow grease. 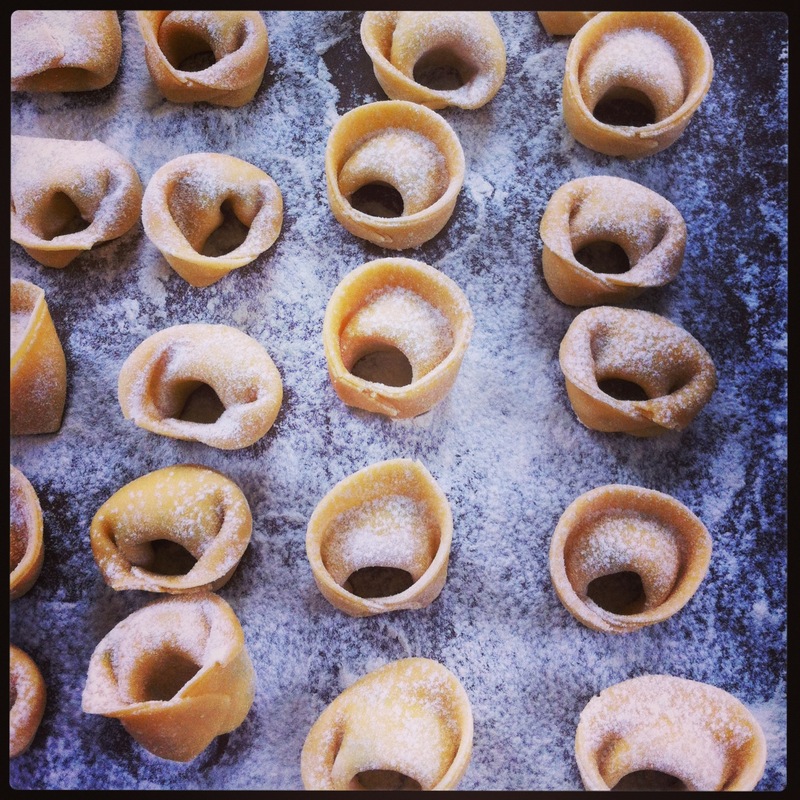 As for the filling, typically tortellini is filled with a meat or cheese mixture. I decided to go with a trio of cheeses – ricotta, Parmigiano-Reggiano, and Asiago. I love the silky texture of ricotta, and I love the salty bite that Asiago and Parmigiano-Reggiano provide. Fresh parsley is a natural choice in terms of herbs, and I added a touch of freshly grated nutmeg to warm up the flavor a bit. After a few grinds of black pepper and a little kosher salt, my filling was done. Super delicious, super fast and easy, and you can spread the leftover mixture on slices of toasted baguette for a snack! Yum! Making fresh pasta shouldn’t be intimidating. Really. I mean, you get to use your hands and mix things up! It’s easy, and once you do it a few times, you’ll have the feeling for it and from then on you’ll choose fresh over frozen or dried pasta any chance you can. The only warning I’ll give to you is that making fresh pasta can be a little time-consuming. So, your best bet is to make it when you have a couple of hours to spare, or you can always make it the night before and store it covered in the fridge prior to rolling it out. It helps if you have a pasta attachment for your stand mixer, or even a counter-clamp pasta machine like this. If not, a rolling pin will have to suffice. Don’t fret, it’ll be fine. 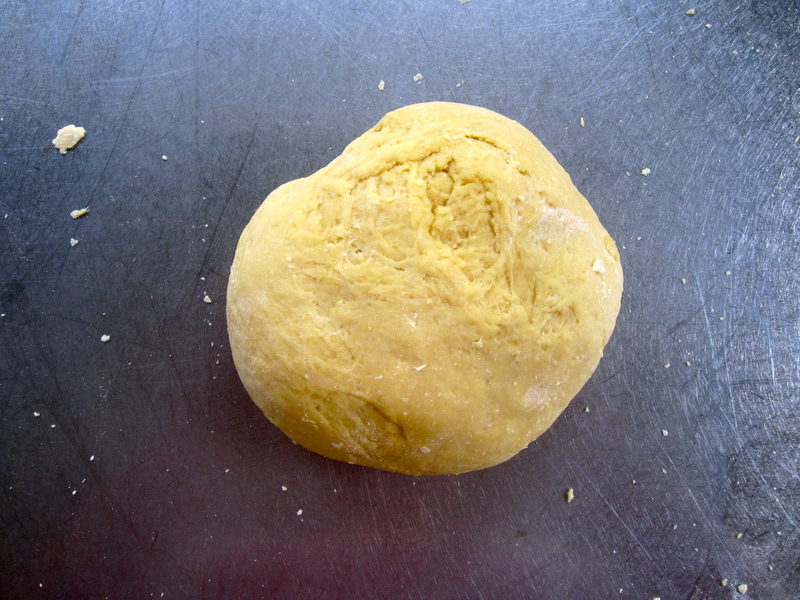 It is important to let your dough rest for at least 30 minutes after you have kneaded it. 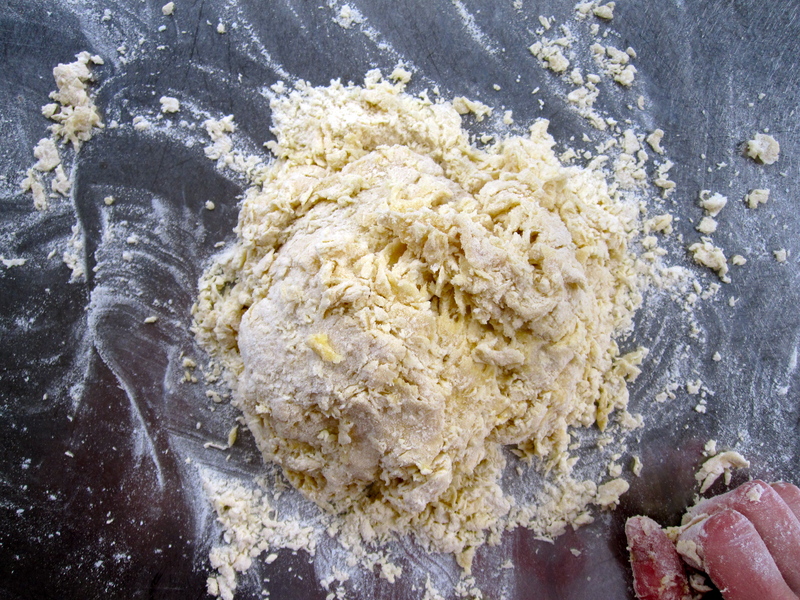 This allows the gluten to develop and as a result, the dough becomes more pliable. Some might say otherwise, but why not take advantage and give yourself a rest while you’re at it? I think the last time I posted I lamented the sluggishness of the oncoming spring weather here in Omaha. Well, surprise surprise, it’s still not here. We’ve had freezing rain, snow, rain, clouds, wind, and pretty much everything else you can think of that isn’t spring weather. To top off the disappointing weather, I have been deep in finals for this semester at school. With this easy version of strawberry shortcake, I hoped to usher in the sun, the budding trees, and the singing birds. For the moment, it lifted our spirits, but ultimately, spring has yet to be sprung here in my lovely city. This isn’t so much a shortcake as it is a sponge cake. It’s light and airy due to the whipped egg whites, but it retains a tender cake texture because of the egg yolks, sugar, and small amount of flour. What I love so much about strawberry shortcake is that there are many variations or additions one can make. 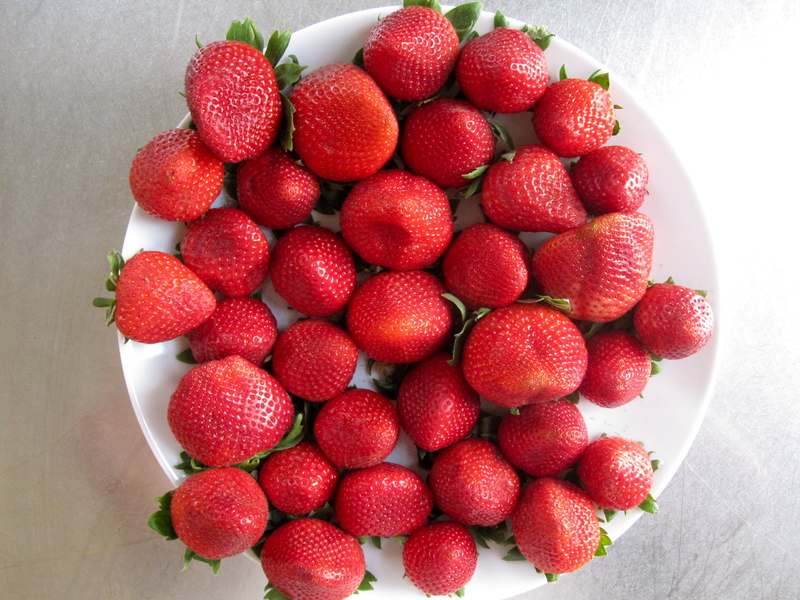 For instance, one could add Cointreau or Grand Marnier to the strawberries as they macerate. Instead of a liqueur, one could add a splash of balsamic vinegar or even the seeds from a vanilla pod. 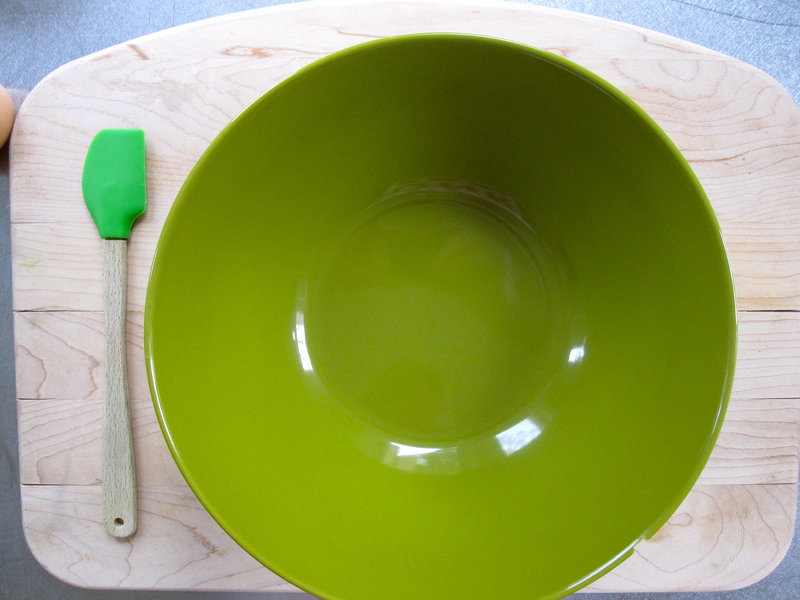 As for the cake, I could see orange zest as being a nice addition to the batter. Or perhaps a dash of cardamom for a floral note? 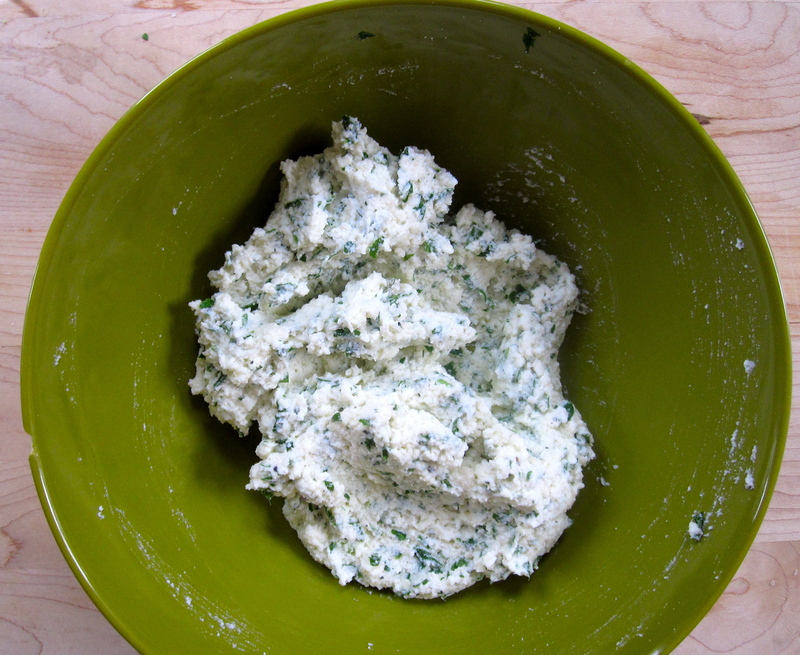 I enjoy adding fresh herbs to my desserts and I think a little fresh thyme would be lovely in the batter! The weather here in Omaha is on the fence. It doesn’t know what it wants. Sunny? Overcast? Chilly? Rainy? Make up your mind already and move on! Yes, it is Spring, but my brain wants nonstop sunny weather. Anyway, I woke up the other morning unsure of what to make for that night’s dinner. I knew I had some things going on during the day, so standing over the stove for hours wasn’t an option. I wanted something fresh, something Spring-like, something easy. After my day’s activities, I stopped at the market. Wandering around the produce section, I spotted some bright orange carrots. They were exactly what the overcast day called for. I thought, “Well, I could roast these and maybe have pork chops or something on the side.” But I wanted to do something more with them. Carrots are an under-utilized vegetable, if you ask me. They have a natural sweetness that comes out during the roasting process, but I didn’t want to stop there. Soup. I came up with soup. Sounds boring, right? Or weird, maybe? Well, you’d be wrong on both accounts. 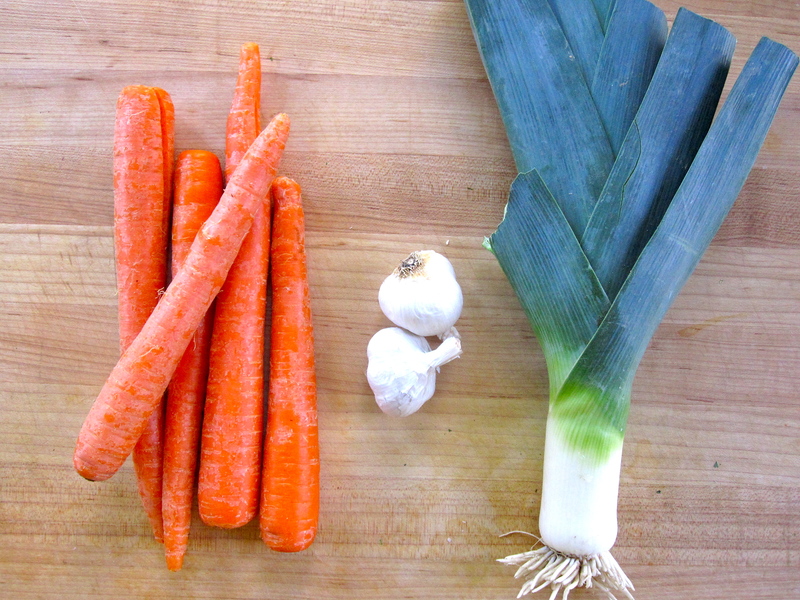 This soup was easily one of the tastiest vegetable-centered dishes to come out of my kitchen. I could hardly believe it! Not that it was without faults, but those aside, it was hearty, spicy, a little sweet, and totally satisfying. This recipe was also just enough for Scott and I to have dinner and then leftovers the following day for lunch. It reheated on the stove quite nicely and paired well with a sliced baguette and salted butter. 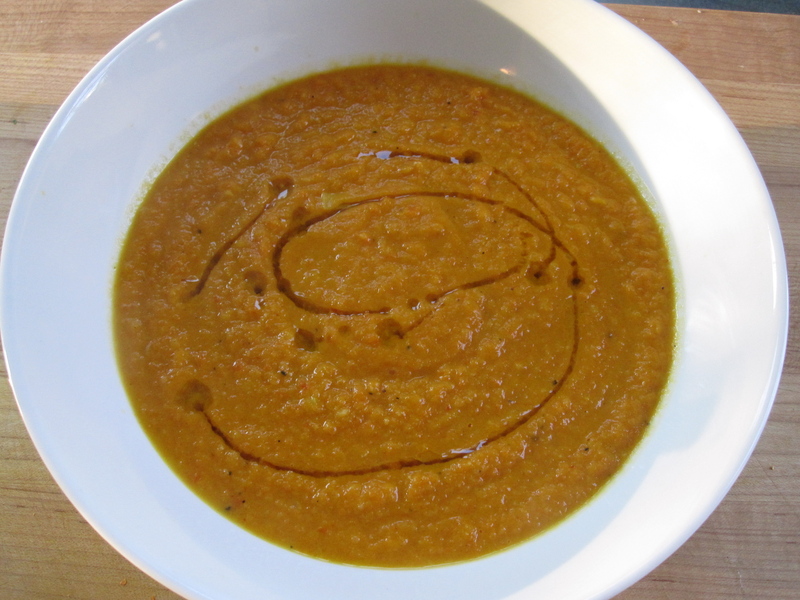 **You’ll need an immersion blender or regular blender for this soup. Heat oven to 400ºF. 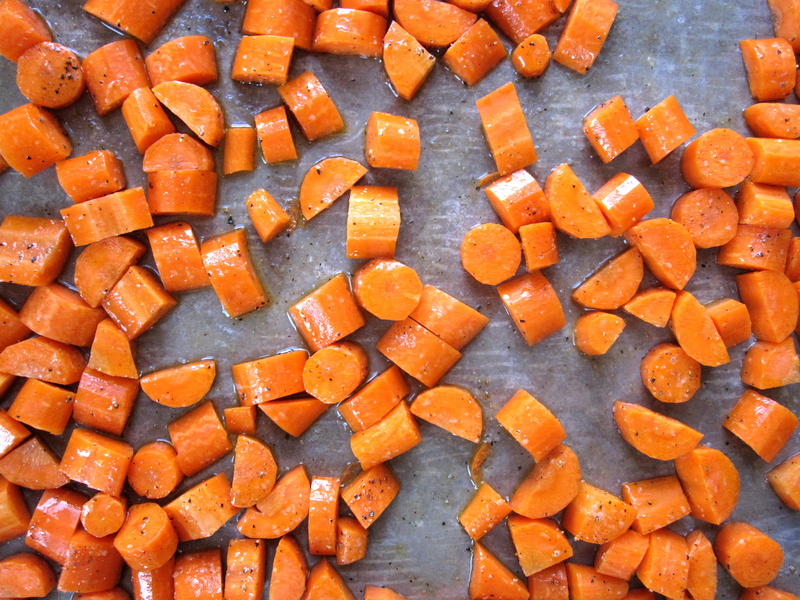 Place carrots in a medium bowl and drizzle evenly with 1 tablespoon olive oil. Sprinkle with cracked black pepper and kosher salt. 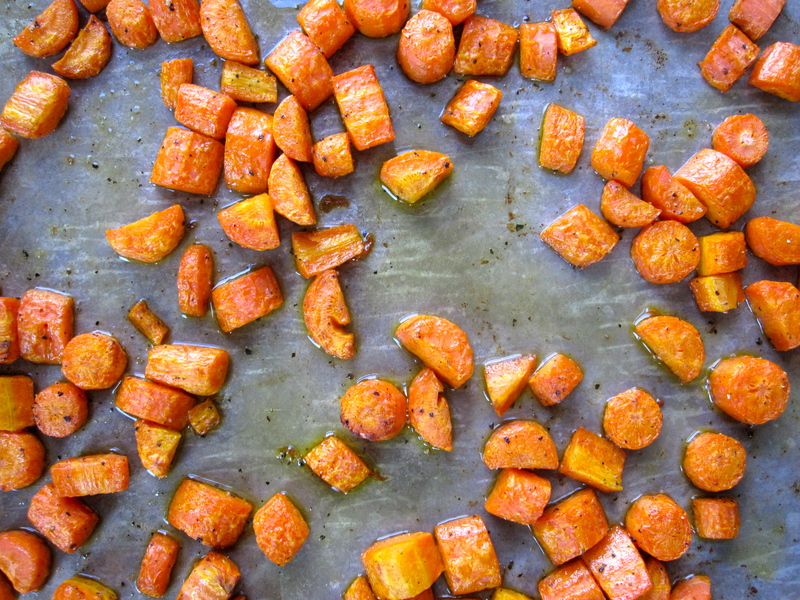 Toss with your hands so the carrots are evenly coated and turn out onto a large rimmed baking sheet. Roast for 25 to 30 minutes or until tender. Remove from oven and set aside. When carrots are done, heat remaining 1 tablespoon in a large stockpot over medium heat. Add shallots and leek to pan, sprinkle with kosher salt and cracked black pepper and sauté until tender, 6 to 8 minutes, stirring often. Be mindful not to burn the shallots and leeks, adjust heat if necessary. 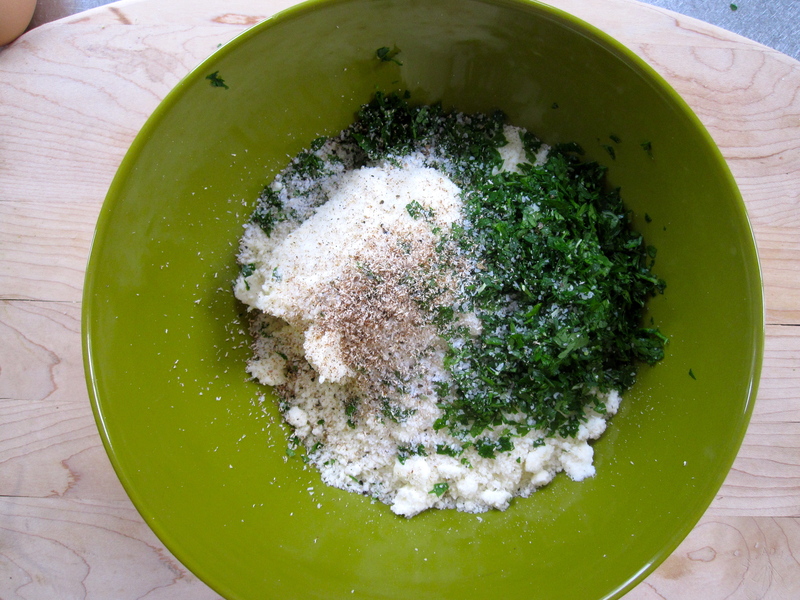 Add minced garlic and ginger paste, stir well. Sauté until fragrant, about 1 minute. Stir in crushed red pepper flake, ground cumin, and ground coriander and stir until fragrant. Add sherry vinegar and honey, stir into mixture. Add roasted carrots and chicken stock. Bring to a boil. Reduce heat to low and allow it to simmer for at least 15 minutes. Use an immersion blender or regular blender to purée. Garnish with a drizzle of olive oil. A dollop of crème fraîche or some chopped fresh cilantro would be lovely, as well.